The material was processed by Choro Sidikbekov. We call your attention to the article by Kirill Kuzmin, that was found in the book “Beaten Tops”. In this article there are described those ascents that had been made up to 1970, so in the scheme that is enclosed to it I plotted only the routes that had been known by that moment. I used the photos made by G. Salnikov and I. Evtushenko as graphic illustrations, lots of thanks to them. The Central Tien Shan . Glacier Zvezdochka stretching for 25 km , the confluent of the glacier Southern Inylchek, goes up to the 7000 m high heights of the range Kokshaal-Tau. And near thee foot of this ice wall – the group of topographers of the Red Army, lead by P.N. Rapasov. The outlines of glaciers, lines of mountain ranges, grades of summits appear on the maps. It was October of 1943. This time in the mountains was like harsh winter, but people tried to finish Ordnance-Survey map. According to different calculations the altitude of one of the mountains equaled 7439.3 m . How could it be so? Was it a mistake? By that moment is had been known that the highest top of the Tien Shan – the Peak Khan Tengri was “only” 6995 m high. But repeated measurings and new calculations confirmed the figure “ 7439,3” . It was a discovery. The Mount was named Pobeda Peak . People who made that discovery were conferred a decoration upon the Big Golden Medal of Semenov-Tien-Shansky. The Pobeda Peak is the most Northern mount of more than 7000 m in the world. It is a mount–mystery, mount with it's own special character. The history of opening it up is full of heroism, joy of victory. The Pobeda Peak is not a point. It has it's beginning at the turn of two highest ranges in the Tien Shan – Meridian Range and Kokshaal- Tau Range . The Meridian Range in the South turns on the ice wall Kokshaal-Tau Range . In the place of the joint the altitude of the range is 7003 m . It is the Eastern Top of the Pobeda Peak . From this Peak the ridge goes to the South, at first becoming somewhat lower, then reaches an ascent, that was named by soviet alpinists “ Soviet Armenia Peak ”, and, after a slight lowering comes to the ascent to the main top of the Pobeda Peak . It is an unusual top: it is a ridge, rather sharp, rocky in the East and ice in the West, it stretches for about 1500 m . Father to the West the ridge goes down by three rather steep ledges to the point 6900 m and then goes on up to the next slight rise (the altitude – 6918 m ). It is the top by witch 10-km long massif of the Pobeda Peak ends. The Kokshaal-Tau Range stretches farther to the West, having in the nearest to the Pobeda Peak 20 km rises 6744 m , 6565 m , 6088 m .
Year 1936 in the Central Tien Shan was the year of victories and year of tragedies. Two groups made an ascent to the Khan Tengri Peak , that was known as the highest point of the Tien Shan . They were a group from Almaty led by E. Kololnikov and a group from Moscow led by E. Abalakov. But on the descent from the top, the second group was caught by foul weather and some members of the group got serious chilblains that caused the death of the Swiss alpinist Laurence Saladin and serious amputations for Vitaly Abalakov and Mikhail Dadiomov. “Let's Help the Abalakov's Group” – the headings like this appeared in newspapers in September in Almaty, and at the end of the month Moscow alpinists welcomed the heroes of Khan Tengri on the Kazan railway station. The dramatic events, concerned with this ascent, made even the results of the observations of the explorers of Khan Tengri closed. When the alpinists were on the top of the Khan Tengri they paid attention to a peak that was to the South from them, it could be compete with the Khan Tengri in it's height. That peak was situated somewhere in the upper reaches of the glacier Zvezdochka. Two years later an expedition of alpinists led by famous professor A. A. Letavet was organized to an unknown peak. It is necessary to add that the peak, “that represents a huge ice massif much higher than the surrounding mountains” was noticed by A. A. Letavet himself in 1937 from the top of the Mount Karpinsky . The expedition of 1938. The leader of the expedition was the participant of the group that made an ascent to the Khan Tengri in 1936 Leonid Gutman. A lot was written about extraordinary severity of this “dump corner” of the Tien Shan , about free-flowing snow, but the group led by Gutman was the first to have felt it on it's own back. Nowadays it is difficult even imagine how could three Young Communist Leaguers – L. Gutman, E. Ivanov and A. Sidorenko, having so imperfect equipment, made a successful ascent to the peak, that they named as a “the Peak of the 20 th anniversary of AULYCL”. But it was not the discovery of the Pobeda Peak . The alpinists themselves assisted in discovering the Peak once more 5 years later. First of all they considered Khan Tengri to be the highest point of the Tien Shan and thought that it was impossible to find a mount higher than 7000 m . According to the registrations of an old aneroid barometer, they wrote that the altitude of the Peak was 6930 m . Secondly, they recognize long apical ridge as one more unknown peak. To put the cart before the horse, I can say that comparison photos made by Gutman and Ivanov from the Peak of the 20 th anniversary of AULYCL in 1938 with the photos made by the group led by V. Abalakov that reached the top of Pobeda Peak in 1956 showed that they were taken from one place. This proved the identity of the Pobeda Peak and the Peak of the 20 th anniversary of AULYCL, and also that the first ascent to the Peak was made on the 19 th of September in 1938 by Leonid Gutman, Evgeny Ivanov and Alexander Sidorenko. The discovery of the Pobeda Peak as a mount higher than 7000 m and exact evaluation of it's altitude, that gave our country the second, according to its height, peak, after the Communism Peak (7495m), attracted great interest to a new peak where never as thought many people a man had been. The first people to made an ascent to Pobeda Peak were alpinists from Almaty led by E. Kolokolnikov. Experienced alpinists A. Ivanov and A. Bagrov (both from Moscow ), P. Semenov (from Leningrad ) were also invited to participate in the expedition. The group made an attempt to made an ascent along the way that had been routed by L. Gutman and his friends. But on this occasion the alpinists didn't even managed to step over the boundary of 6000 m: they were thrown down by an avalanche fortunately, nobody was hard hit by it. This event made the alpinists to be more careful and to look for new ways to the top. In 1952 and in 1953 the groups of alpinists from the Turkestan command under the direction of V. Racek made a detail prospecting of the massif of the Pobeda Peak . Reconnoitring (Learning) the approaches to the Pobeda Peak , the alpinists made an ascent to the Druzhba (Drujba) Peak ( 6,800 m ) (the leader was V. Nozdruhin). In 1954 the alpinists from Almaty appeared in the upper reaches of the glacier Inylchek again. They made an ascent to Khan Tengri. (the leader was V. Shipilov). The year 1955 started. There were expeditions that went to the Pobeda Peak . 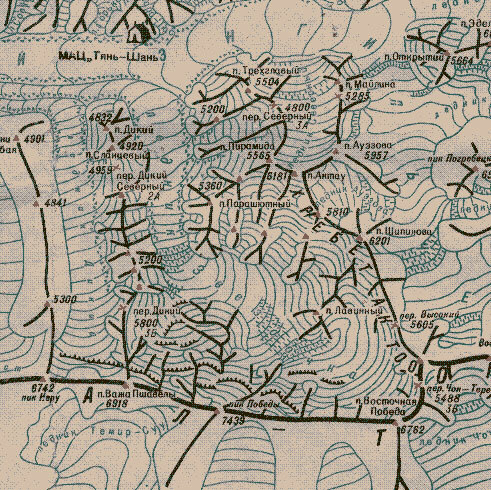 The alpinists of the Turkestan and Uzbekistan command under the direction of V. Racek chose a route along the Northern slope (the Gutman's way) and the alpinists from Almaty under the direction of E. Kolokolnikov decided to pass the 6 km long Eastern ridge. They thought that it was a long way, the ridge is nowhere lower than 6900 m all along, but there was no danger of avalanche, they remembered their attempt to make an ascent along the Northern slope in 1949. All-Union section of alpinism (it was the name of modern Federation of Alpinism that time) emphatically recommended to combine expeditions. But, it seemed, that each of the groups wanted to win the laurels independently. Then there was a queue established, in order to have a powerful reserve to render assistance if necessary. The group from Almaty was first to go. The alpinists from Uzbekistan could begin the ascent only after returning back the first group. But young members of both of the groups, aspiring to be the pioneers on the top, forced the events. On the 12 th of August the last group of the Kazakhstan expedition went up to the Base (Basic) camp on 4200 m , and on the 13 th of August the decision that preparations for the ascent were complete was accepted, and the group of 16 alpinists under the direction of V. Shipilov began the storm of the top on the 14 th of August. As an experienced alpinist E. Kolokolnikov (he was the leader of the expedition) understood all that such hurry could be unwarranted and dangerous, but lost the control of the group and relied on physically strong but not experienced enough sportsmen. The objections of M. Grudzinsky and A. Suslov, who were the members of the expedition as E. Raspiev and R. Selidganov, weren't attended. On the 15 th of August the group was near the upper reaches of the glacier Zvezdochka, on the altitude of 5100 m . On the same day, violating the straight indications about the queue, the group of the combined expedition of Turkestan and Uzbekistan commands under the direction of E. Nagel started the storm of the Peak. In the evening of the same day the group led by V. Shipilov learned about the start of the parallel group by the light signals and decided to force the temp again. On the 16 th of August it, having passes the crosspiece of the pass Chon-Teren, reached the point 5800 m and on the 17 th of August – the point 6350 m . There P. Meniaylov got hard headache and was sent down with A. Semchenko, N. Shevchenko and R. Tarodin. The rest of the group went on ascenting and on the 18 th August passed the night on the altitude 6800 m . On the next day, although the weather was excellent, the group was able to go up for only 100 m and made a bivouac on the altitude 6930 m , in less then 100 m from the Eastern top of the Pobeda Peak . The weather was clear and silent. It seemed that nothing bad could happen. Going up along the ridge up to the 7000 m boundary, the alpinists that hadn't passed the acclimatization quickly lost forces. On that day they passed only 100 m along technically easy way. The alpinists were tired, made the camp hastily they didn't notice the clouds that said about worsening the weather.